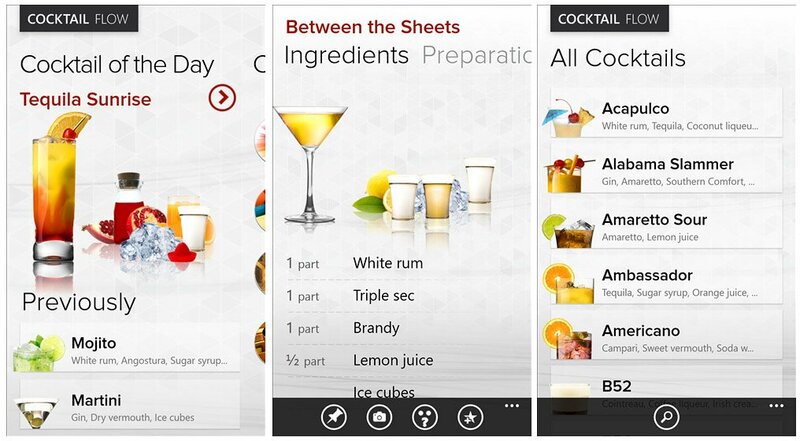 Some Windows Phone apps to help you say farewell to 2014 and welcome the New Year with a few drinks. As everyone prepares to bring in the New Year, we thought a Windows Phone app roundup of mixology apps would be in order. Many are planning social gatherings where you'll need to showcase your bartending abilities or maybe there will be those who would like to impress their dates by ordering a fancy beverage while out on the town. These apps will help with both tasks. We've got a few mixed drink apps and a few beer apps for those who prefer the brewery to the distillery. As always, if we missed your favorite cocktail or beer app please feel free to sound off in the comments. There are plenty alternatives available in the Windows Phone Store and we picked the ones that jumped off the screen at us. Cocktail Flow (trial/$2.99): Cocktail Flow has always been an impressive app for mixology. 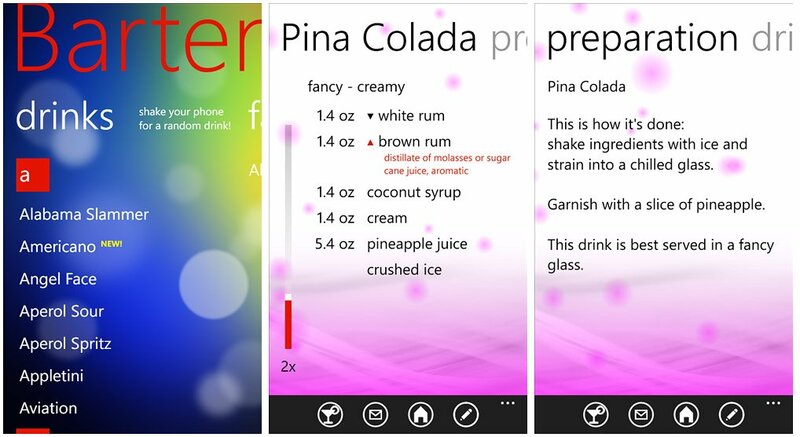 Recently updated to Windows Phone 8, Cocktail Flow lets you search for drink recipes by keyword, key ingredient, occasion, based on what you have in your bar, and there's a surprise me feature that will.... well... surprise you. Cocktail Flow also has packages that list drinks suitable for certain occasions (Christmas, New Years, Valentine's Day, etc.). Cocktail Flow is a very clean looking, recipe rich, cocktail app. There is a free trial version that is limited in functionality (no bar stocking features or package downloads). Beer Me (free): For some a nice cold beer is just as refreshing as a well mixed drink. 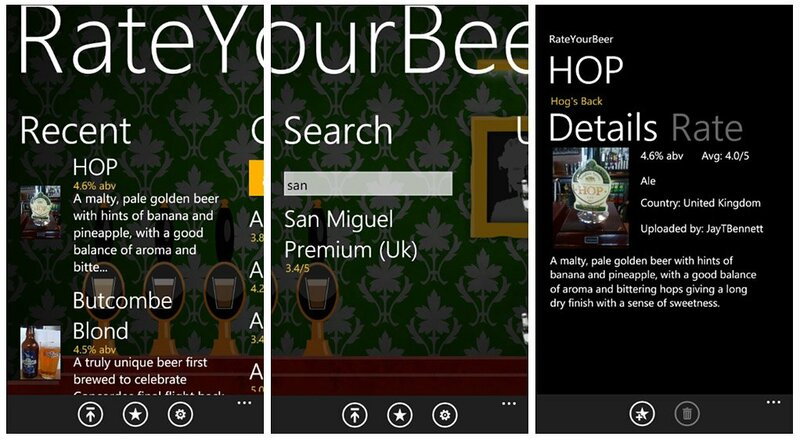 When you're in the mood to try a new beer, Beer Me is a Windows Phone app that might help. You can search for beer types by keyword and pull up information on beers including their ratings, alcohol content, brewer information and history (if available). You can flag beers as favorites and rate/share the beer's yourself over on Facebook. The only downside to Beer Me is that you can't search a listing of the beers. Which means you'll need to at least have some idea of what you're looking for. Bartender (trial/$1.29): Much like Cocktail Flow, Bartender offers you a wide assortment of drink recipes. Drinks are listed alphabetically, by taste, by type, and searchable by keyword and/or ingredient. Bartender also lists a worldwide top ten list of drinks. Drinks recipes can be shared and tagged as favorites for quick reference. The individual drink listing also details the preparation steps, a log where you can make notes on the drink (e.g. where you had it, how it tasted, etc.) and rate the drink. While it lacks the bar stock and package features of Cocktail Flow, Bartender is a nice app within its own right. There is a free, fully functional trial version available for Bartender. Rate Your Beer (free): Rate Your Beer has been around for some time and is a user driven database of beers. The catalog lists a healthy amount of beers that have been tried, tested and reviewed by Rate Your Beer users. Listings can be searched alphabetically or searched by keyword. Details on the beer include alcohol content, rating, Country of origin and any details on the brew (if available). Membership (free) is required to contribute to the list or rate the beers. Cocktail Genie (trial/$.99): Cocktail Genie has a decent library of mixed drinks that can be viewed alphabetically, by category (type, base ingredient, etc) or if you're not sure what you're in the mood for there is a Surprise Me feature that will generate a random recipe. Drinks can be tagged as favorites as well as listed on a Frequent and Recent Page. 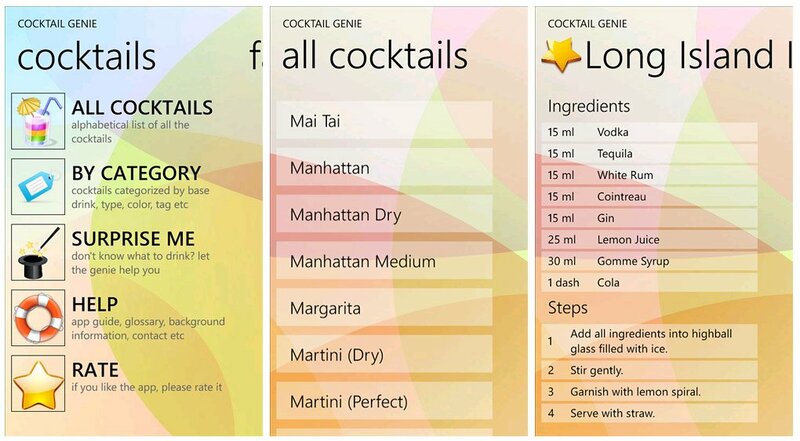 Cocktail Genie is a bare-bones mixology app that only pulls up the ingredients and steps in making the beverage. It lacks the ability to share or rate the drinks, but those features aren't necessarily "must have" features. While these apps can come in handy on New Year's Eve, if you like enjoying an adult beverage from time to time, host parties, or just want to have a little variety in your drinks these apps will help you along the way. Just keep in mind that if you partake with the concoctions these apps can create, do so responsibly. This article was originally published in December 2012, but has been updated on December 2014.